Nuraghes (a type of ancient structures) belong to one of the most mysterious ancient monuments in the world. An unknown civilization called the Nuragic civilization, built over 7,000 stone structures on Sardinia, an island the size of Sicily. The Nuragic civilization appears to be much older than previously believed, much older than we can imagine. Fig. 1: This Nuraghe (Nieddu) is an example of a simple Nuraghe. There are thousands of these on Sardinia that are quite similar to this one. Many of them are in a worse condition than this one. The so-called complex Nuraghes are often much larger and were used for more advanced astronomical observations. 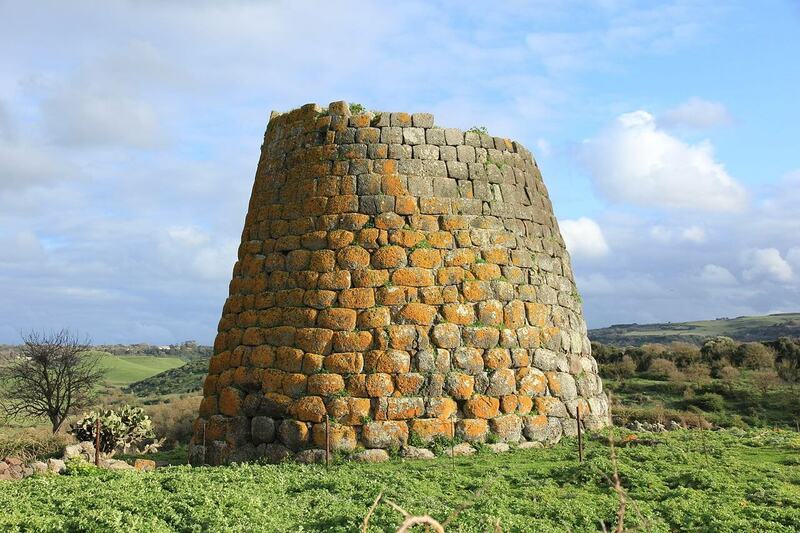 A Nuraghe is a tower-shaped, prehistoric stone structure that can only be found in Sardinia. It is said that they date from the second millennium B.C. and to the Roman conquest. Most people believe that Nuraghes are astronomically aligned structures. But nobody can say with certainty which kind of astronomical purpose they served. Research by Zedda and Belmonte in 2004 into the orientation of the openings of simple Nuraghes show that they peak at an azimuth of 148°. There seems to be no match with one of the Cardinals, the Equinoxes, nor with one of the Solstices. The current Summer and Winter solstices of the rising Sun in Sardinia occur respectively around 58.5° and 121.5°. Nuraghes show also peaks in declination between 40° and 44° which has led to speculations that they might have been oriented to Alpha Centauri. Why an alleged “primitive” culture would point its towers to one of the many stars that are light years away remains of course unanswered. Most researchers divide Nuraghes into two groups: Simple Nuraghes and complex Nuraghes. This article will deal only with the simple Nuraghes. We have analyzed the complex ones separately and individually because they are too elaborate to be included with the many simple ones. Fig. 2: Typical floor plan of a simple Nuraghe. The orientation of the entrances of the simple Nuraghes peak at an azimuth of 148°. This orientation appears to correlate strongly with Pole III and Pole IV. What Was the Function of a Nuraghe? Why are they all so similar but strangely oriented? By applying our new mathematical theory, The Holistic Orientation Based Dating Method, the age and the function of the Nuraghes are both well explained. Yet, our conventional history appears to be built on misinterpretations, fixed ideas, lies, and most of all, the common practice of unscientific thinking by Academia. Fig. 3: We have used more than 590 ancient structures, such as pyramids and temples, to prove how and when the Earth’s crust shifted according to the rhythm of the Milankovitch cycles, or better yet, Earth’s eccentric orbit around the Sun. While Nuraghes are not part of our dataset, they also appear to follow the 47.1 W reference line – with almost surgical precision. The odds for the Nuraghes to also be coincidentally part of that same line of nodal tracks is 1 to 893,000. | © 2016-2018 by Mario Buildreps. It is generally believed that there is no correlation between the Nuraghes and the countless other ancient structures around the world. But that appears to be one of the biggest mistakes science has made over the last few centuries. Nuraghes appear to belong to the same global civilization that spanned the entire planet – one of the countless Lost Civilizations. The whole idea that ancient cultures have existed for hundreds of thousands of years is incredibly difficult to grasp for most people – and for good reason – because in our educational system we are relentlessly conditioned with the same ideas regarding ancient history, which ultimately turn out to be false. Fig. 4: Most of the simple Nuraghes are oriented between 140° and 160°. | © 2016-2018 by Mario Buildreps. Most archaeologists will not even consider the idea that ancient structures might be hundreds of thousands of years old. Even when remnants of Homo sapiens are found in Morocco and they appear to be over 300,000 years old, that significance is still not appreciated. The ruling paradigm seems to be much too entrenched to affect change. Only mathematics has the power to overthrow tough paradigms. It is then up to us to transform our own conditioned belief systems to become a higher level of truth. We ask these questions: Why would a 300,000-year-old Homo sapiens be less “smart” than we are today? Is it because they did not attend the same schools we did? There are insufficient reasons to assume that they would be either smarter or dumber than we are because then they would, by definition, be considered another species. Homo sapiens is a species that is highly “trainable” and that is the reason why attending school has a high success rate – it is not the other way around, we are not a smart species because of our education. Education only improves our chances of success in our economy driven society. Fig 5: DNA patterns show correlations with orientation patterns of the Homo erectus family tree. The “Out of Africa” hypothesis is short-sighted and based on incomplete and outdated evidence. Why did the Neanderthals, a tough, highly intelligent, and well-adapted species, become extinct? Ask yourself this simple question: If most manmade structures are not older than some 12,000 years old, what were Homo sapiens then doing the rest of the time? How could a small number of Sardinian inhabitants construct many thousands of massive stone structures over the course of only a few thousand years? Was Homo sapiens wandering around for over 400,000 years doing nothing and leaving no traces of significance? We have found compelling proof that Homo sapiens was, in fact, very active over the last 450,000 years. | © 2016-2018 by Mario Buildreps. Fig. 6: This animation gives an indication of how the latitudes of Sardinia have changed during the “glaciation cycles”. Glaciation cycles were, as we have demonstrated, crustal displacements. The Nuragic civilization appeared to have a firm tradition to orient the openings of the stone structures to the South and continued to do this consistently over a period of more than 200,000 years, even during the periods of crustal unrest. | © 2016-2018 by Mario Buildreps. Geologists insist that there is no evidence for significant crustal deformations over the last half million years. But did they look well enough at their own evidence? Paleomagnetic records contain much data that are pointing not only to magnetic movements but also to movements of the crust. With our research, we have proven that such analysis contains, by definition, two variables – a moving crust and directional changes of the magnetic field – but this cannot be completely resolved without introducing a second, completely different measurement. During the crustal movements, the paleomagnetic data show an increased hysteresis (the dependence of the state of a system on its history) and an increasing uncertainty of the alleged magnetic pole position. In other words, the paleomagnetic records show a larger spread during periods of crustal unrest, which is, of course, logical during periods of crustal displacement. Geologists have never found a credible explanation for the varying hysteresis, other than just unexplained “noise”, thus obviating further examination. They are unaware that there might be the need for a second variable, namely crustal movements caused by very heavy earthquakes which, in turn, were caused by a high eccentric orbit of our Earth around the Sun. Because the Earth’s inner and outer crust are rotating bodies, they will react perpendicularly to the direction of rotation when a force is acted upon them – exactly like a spinning top. Because the crust has the highest velocity and is at the same time the lightest part of the Earth, it will react more intensely than all the other, much heavier components. 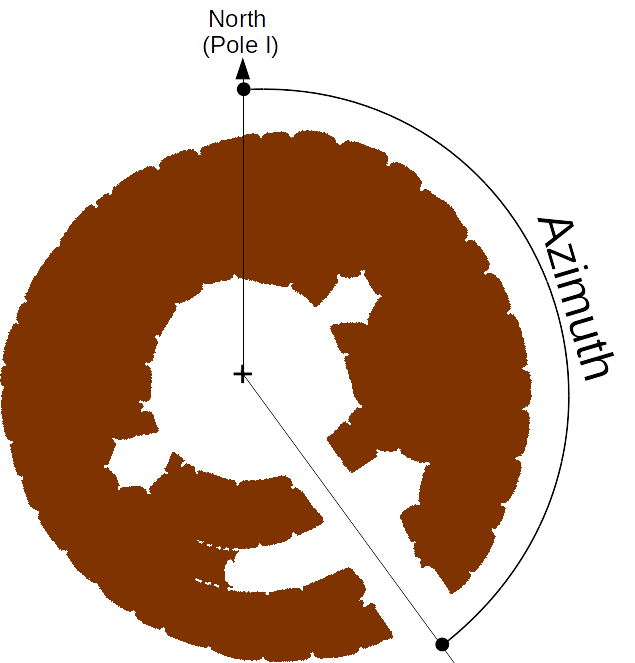 That is the reason the crust migrated in the latitudinal (vertical) direction. Note that the geographic South pole hardly changed its position over the last half million years while the rest of the crust was heavily deformed. In that respect, this deformation process behaves as if the Earth is a flat plane. Fig. 7: The largest spikes in the data correlate with Pole IV, with a probability of more than 99.99%. Our research shows that these Nuraghes are between 240,000 and 270,000 years old. | © 2016-2018 by Mario Buildreps. We have demonstrated with our theory and method that there were four former geographic poles which we call Pole II to Pole V (Fig. 3, Fig. 6, and Fig. 7). Our current geographic pole is Pole I. This is not just a hint, or an idea, because solid mathematics supports our method. 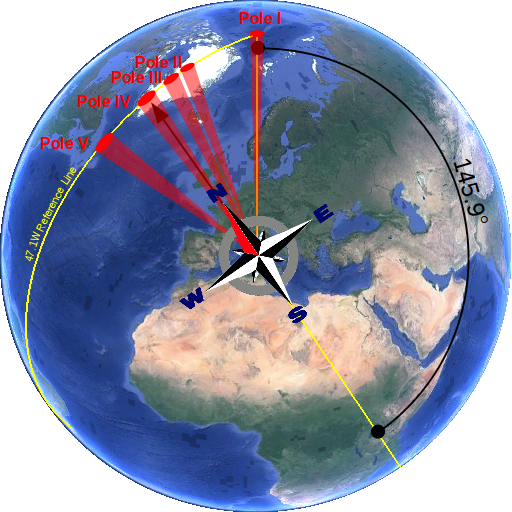 The geographic pole is the spin axis of the Earth. Many people commonly confuse this with the magnetic pole. If the Nuraghes were built during one of these periods, the orientation of the Nuraghes could well relate to one or more of these poles. This is where we found our first clues. 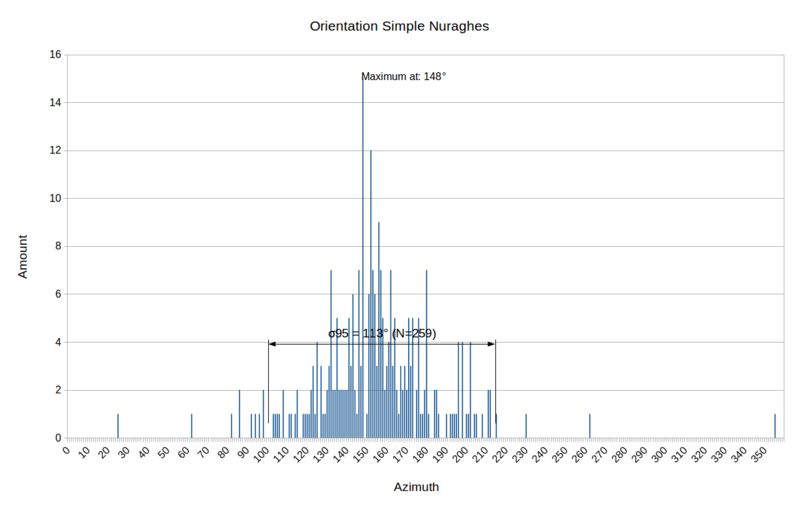 If there are clusters of orientation that correlate far above average with one or more of the ancient poles, we then have found substantial proof of the true age of the Nuraghes. Our research indicates that the Nuragic culture spanned a timeframe of hundreds of thousands of years and that this civilization survived not only the periods of stability but also the periods of crustal unrest. And indeed, its Nuraghes appear not only to point predominantly to the former poles but appear also to follow the migrating path of the pole. The documented data that was used had, of course, orientations with Pole I as the one and only possible reference. These data had to be reprocessed to look for correlations with Pole II to V locations. Table 1: We are seeing something that is very interesting. The number of simple Nuraghes that are exclusively relating to Pole III is high and to Pole IV is extremely high. The structures are grouping together in these nodal clusters and the odds for that to be the result of a coincidental process is close to zero. It also becomes clear that there is no distinct relation between simple Nuraghes and Pole I and Pole V. We have compelling proof that Nuraghes relate to Pole IV and are thus a large group of Nuraghes that is between 240,000 and 270,000 years old. As we have already mathematically proved with Chichen Itza, as well as with Stonehenge, that these ancient cultures were able to track with surgical precision the ancient cardinal directions and the solstices. These ancient sites, situated at totally different locations, also relate very strongly to very ancient poles locations. Many of the Nuraghes are oriented between the nodal pole positions. It seems evident that the civilization(s) tracked the shifting crust over many millennia. That explains, in the simplest way, why we find so many Nuraghes spread across the island of Sardinia. First, we looked for clues for orientations between the pole positions. It was not difficult to see that there is NO relation in the data for the Equinox and the Summer Solstice, but the peaks in the data correspond extremely high with Pole III and Pole IV. It literally teems with proof. When we look at the graph presented in Fig. 4, we see a clear non-random distribution. The peak at 148° (n=15) is extraordinarily high when we regard the number of involved measurements (N=259). If we would be looking at a random distribution, a peak of this magnitude would only occur once in every 76.5 million times. Therefore, it is clearly not a random distribution. That is why we know that specific orientations were intentionally selected and their peak correlates with Pole IV. Even if we remove the largest peak, there still remains a strong correlation with Pole III. Our proof, however, hangs on more than just one thread; the Nuragic civilization spanned over a period of hundreds of thousands of years. Table 2: This table contains some of the simple Nuraghes that, based on their orientation, correlate with specific very ancient poles. It is very difficult to prove the true antiquity of an individual simple Nuraghe based on its orientation alone. Basing the results on a large group of structures gives better results. By examining complex Nuraghes on specific solstice angles, we have found additional proof of the true antiquity of this very ancient civilization. We had previously heard about Nuraghes but had never included them in the data set, because the data set contains only square or rectangle buildings, or large arrays like the Donegal alignment or Carnac, which comply with the theory. But then we received a request to investigate the Nuraghes. That’s when we discovered that the Nuraghes are no exception in the recurring relation between ancient structures and the migrating Poles I to V, no matter where we are on Earth. The Nuraghes show the exact same reorientation patterns as the Mayan buildings like Chichen Itza. That is one of the reasons why Sardinia teems with Nuraghes. Every time the crust displaced a little, a new Nuraghe was built to comply with the new cardinal system. That habit resulted for us in a bonanza of data. It also reinforces our theory. Every time we apply our theory to Chichen Itza, Stonehenge, or, in this case, the Nuraghes, it again provides a high degree of validation. The orientation peak at an azimuth of 148° is closely related to Pole IV. The large spike in the data proves mathematically that the Nuragic civilization oriented its Nuraghes to the South during Pole III and Pole IV. It means that this civilization is at least 240,000 years old. It also means that it survived the shift from Pole IV to Pole III. They, the builders of Nuraghes, continued their habit of building Nuraghes and to orient the openings of their structures to the then prevailing South. We are talking here of a highly developed civilization with strong traditions, and probably a deep spiritual understanding of nature. Our research regarding the Nuraghes appears to reveal astonishing details. Whenever our theory is applied to ancient structures, it appears to be correct. It also explains the astronomical use of these amazingly ancient buildings. Our readers are invited to ponder this obvious conclusion and what our theory means for the mainstream disciplines like archaeology, geology, paleontology, climatology, and history in general. Perhaps it is time to radically rewrite our orthodox indoctrinations. Fig. 8: This animation shows how Sardinia became connected to Corsica and how Corsica became connected to North-West Italy. During the migration of the crust from Pole III to Pole II (between 155,000 and 210,000 years ago) the vast ice sheets started to develop to such an extent that the sea level dropped more than 110 meters. The Nuragic civilization became vulnerable to invasions, and that is the most probable reason for its mysterious disappearance. | © 2016-2018 by Mario Buildreps. © 2015-2018 by Mario Buildreps et al. The Nuraghi don’t date to the Roman conquest. They were built from the 18th century bc to the 13th-12th century bc, though more than 3/4 of them were made specifically in the spawn of a few centuries (15th-13th century bc), so well before the Roman conquest of the island (3rd century bc). 30% of the Nuraghi are complex Nuraghi, so they consists of multiple towers and walls. The average original height of a nuraghe was roughly 12 meters, the maximum was around 25-30 meters (Nuraghe Arrubiu). There are almost 7000 known Nuraghi so about 25,000-45,000 individual towers. Did you do the research into the large nuraghe and if so can we read it. Did you also look at Santa Cristian the sacred well. It certainly come from an earlier civilisation. Anything you have on Sardinia would be welcome. Love the article it has always been obvious to me that we were older than ‘they’ say. Thank you so much. Will look it up.